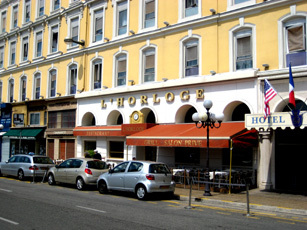 L'Horloge is situated across the street from the beautiful Massena Gardens making it an ideal location for an outdoor lunch. The restaurant is part of the Four Star Grand Hotel Aston and the iinside of the restaurant has a modern upscale dining space. Although the restaurant can be pricey, the daily Plat du Jour for 12.50 euros or the excellent prix fix menu for 24 euros makes it a good value considering the quality of cooking. A choice of desserts is offered as part of the prix fixe which contains excellent homemade seasonal fruit tartes.